& from Belgium / België / Belgique including Kortrijk. This exclusive bundle was acquired from a fan's collection, who was a member of the fan club for many years. They also helped to run charity events including a special quiz using questions provided by the fan club and had their name printed in the fanzine. A Message From Queen - 1989 UK 7" black flexi-disc, manufactured exclusively for the fourth Official International Queen Fan Club convention held at Camber Sands, East Sussex April 1989. A quantity of ten different custom printed carrier bags, printed specifically for different conventions. Three different pens, two from 1993 and one from 1994. Along with two pencils printed with just the groups name. Sixteen shaped badges, dating from 1986 to 1995, with a few duplicates. Ticket for the 1991 Christmas party in Plymouth. A signed ticket for the 1988 Fan Club Christmas Party in Hammersmith, London on the 4th December 1988. This has been signed by Brian May in a blue point pen on the back. 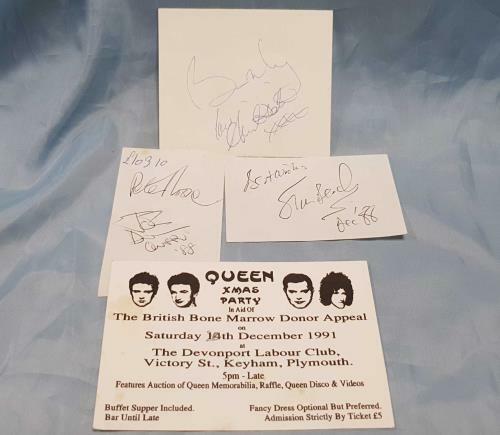 Along with a scrap of paper which has been signed by Peter Hince (the bands roadie & photographer) & John Deacon, and a second bit of paper with an unknown signature signed at the same time. Three identical fabric badges for the 1993 Southport convention, and one featuring an image of the band with the text 'We Will, We Will... Rock You'. Eleven static window stickers for different conventions, with a couple of duplicates but all remain in an unused condition. And finally, four different convention itineraries. Product Information Queen International Fan Club Convention UK memorabilia.